UFR d’Epidémiologie clinique et Sciences médico-chirurgicale, ERTNA-Mohammed V University- Souissi (UM5S)-Faculty of Medicine and Pharmacy, Rabat, Morocco. Background: Vertebroplasty and kyphoplasty are minimally invasive percutaneous vertebral augmentation techniques that have been treatment choices for vertebral compression fractures (VCFs). Our aim is to describe the experience of the Department of Neurosurgery at Ibn Sina University Hospital (Rabat, Morocco) and assess the short and long-term clinical and radiological outcomes and complications of vertebroplasty and kyphoplasty. Methods: We retrospectively studied the charts of 48 patients hospitalized for VCFs in the Department of Neurosurgery at Ibn Sina University Hospital from November 2006 to December 2015. Patients were evaluated using the Visual Analogue Scale (VAS) and detailed neurological and radiological evaluations. Pre- and post-operative data were compared within each group and between the two procedures. Results: Fourty-eight (48) subjects underwent either vertebroplasty (35 subjects) or kyphoplasty (13 subjects). A total of 58 VCFs were observed (10 patients had a VCFs at two different vertebrae). 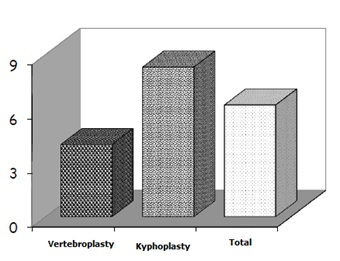 There was no significant difference between kyphoplasty and vertebroplasty regarding postoperative VAS (p = 0.220). The mean preoperative kyphotic angle was 18° (±4°), whereas the mean postoperative kyphotic angle was 12° (±5°). In the long term (mean follow-up period was 15.2±4.6 (range: 6-50 months), none of the patients declared a loss of autonomy or a decrease in their activity. Conclusion: Our study is in accordance with the current literature data. Our results demonstrate that both kyphoplasty and vertebroplasty improve the quality of life of VCFs patients through their action on function and pain relief. Vertebroplasty and balloon kyphoplasty are minimally invasive therapeutic options used for the treatment of vertebral compression fractures. Both are percutaneous techniques, performed under radioscopic control. Vertebroplasty involves the injection of bone cement (mostly polymethylmethacrylate (PMMA)) into a vertebral body fracture to improve pain and stability of the fracture. Vertebroplasty was performed for the first time in 1984 in France by Galibert and Deramond for the treatment of an aggressive hemangioma at the C2 vertebra with very satisfying results. The proven efficacy of the procedure led to an extension of its indications to metastatic and myelomatous osteolytic lesions, and then to osteoporotic vertebral compression fractures (VCFs) . Kyphoplasty was initially developed by Reiley in 1998 from the vertebroplasty concept. At first reserved to tumoral and osteoporotic lesions , it has gradually established its role in the treatment of fractures in young patients . The principle of kyphoplasty is to restore vertebral body anatomy by inflating a balloon and then reinforcing the anterior column of the vertebra with cement. The balloons create a cavity within the vertebral body, compressing the cancellous bone and thus limiting the risk of cement leakage from the vertebral body . The benefit of these minimally invasive techniques compared to conventional strategies has been demonstrated in terms of pain and functional improvement. Cement injection into the vertebra may have an analgesic effect by consolidating microfractures and reducing the mechanical stress associated with weight and activity, and by destroying bone nerve endings by cytotoxic and exothermal action in the course of cement polymerization. Moreover, morbidity is minimal [8, 11]. The purpose of this study is to report the experience of the Department of Neurosurgery at Ibn Sina University Hospital (Rabat, Morocco) with these two procedures and assess the outcomes of the patients who underwent vertebroplasty or kyphoplasty regarding complications, correction of vertebral body height, kyphosis angle and pain relief assessment using visual analog score (VAS) for pain. We retrospectively studied the charts of 48 patients (23 women and 25 men) hospitalized for VCFs in the Department of Neurosurgery at Ibn Sina University Hospital from November 2006 to December 2015 and who had undergone percutaneous vertebroplasty or kyphoplasty. The decision of vertebroplasty or kyphoplasty was previously systematically discussed in the context of a multidisciplinary meeting attended by neurosurgeons and radiologists. Demographic characteristics, preoperative visual analog scale (VAS) scores for pain assessment, number of affected vertebrae, kyphotic angles were measured in the 1st week as control radiographs and then were compared to postoperative parallel variables. Before the procedure, all the aspects were explained to the patients and detailed biochemical, radiological and neurological evaluations were performed including pain assessment with the use of the Visual Analogue Scale (VAS). A pre-anesthetic consultation was also carried out. The procedure was performed under general anesthesia or under sedation and local anesthesia at the injection site. An antibioprophylaxis was given systematically before the beginning of the procedure. The injection of PMMA was done under permanent fluoroscopic control in a prone position to verify the absence of posterior leakage of cement to the spinal canal. The volume of cement injected was determined intraoperately by the operator in order to adequately fill the vertebral body. For kyphoplasty, the balloons were slowly inflated to reduce the compression fracture and create a void for cement injection. Balloon inflation was done in an alternating manner from side to side, under fluoroscopic imaging guidance. The inflation was stopped when the pressure exceeded 220 PSI, or if the balloon reached the endplates, or if any middle column fragment started to move posteriorly. The balloons were then deflated and removed from the vertebral bodies and the cannulas. At this point for kyphoplasty, PMMA was prepared and injected in the cavity created by the balloons. Postoperative evaluation included a full clinical assessment and, when appropriate, a radiological investigation with plain radiographs, CT and MR imaging. The mean follow-up period was 15.2±4.6 (range: 6-50 months). Data were analyzed using SPSS (IBM SPSS statistics 20.0). All measurement data were presented as mean ± SD. For quantitative variables, pre and post-operative data were compared using a student’s t-test for continuous quantitative variables and by the Wilcoxon test for discrete variables. Comparison was performed for pre and post-surgical data as well as between vertebroplasty and kyphoplasty. A p value <0.05 was considered as statistical difference. Patients who underwent vertebroplasty or kyphoplasty procedures for acute or sub-acute symptomatic vertebral compression; osteoporotic compression fractures, traumatic compressions, and osteolytic vertebral lesions, including metastases, hemangiomas, and multiple myeloma, were included. Fourty eight (48) subjects underwent either vertebroplasty (35 subjects: 16 (45.7%) men and 19 women (54.3%)) or kyphoplasty (13 subjects: 9 men (69.3%) and 4 (30.7%) women subjects). The mean age of the study population was 55 ± 12 years. A total of 68 VCFs were observed (20 patients had a VCFs at two different vertebrae). About 20 patients (41.7%) were operated following post-traumatic VCFs, 12 patients (25%) were operated because of an osteoporotic fracture following a mild trauma or spontaneous fracture, 10 subjects (20.8%) for osteopenic fractures, 3 patients (6.25%) because of vertebral body metastasis and finally 3 patients (6.25%) were operated on because of VCFs secondary to Kahler’s disease. The mean preoperative VAS score was 7.8 ± 0.6 for the total population (mean preoperative VAS was 8.0 ± 0.8 for kyphoplasty and 7.6 ± 0.6 for vertebroplasty). The mean postoperative VAS was 1.8 ±0.8 for the total study population (mean postoperative VAS was 1.7±0.6 in the kyphoplasty group and 1.9±0.7 in the vertebroplasty group; Figure 1). There was no significant difference between kyphoplasty and vertebroplasty regarding postoperative VAS (p = 0.220). The mean preoperative kyphotic angle was 18° (±4°), whereas the mean postoperative kyphotic angle was 12° (±5°) (Figure 2). An average of 6.1° of improvement in the kyphotic angle was seen after the procedure in the total population. The mean kyphosis angle correction was 8.3° in the kyphoplasty group and 4° (±1.63) in the vertebroplasty group (p <0.001) (Figure 3). Six patients had non-symptomatic PMMA leakage, and one patient had a neurologic deterioration which prompted a hemi-laminectomy as an emergency procedure with a good outcome. None of the patients had adjacent level compression fractures during follow-up. No tumour evolution was observed in the patients with Kahler’s disease or vertebral body metastasis. Most of the patients were mobilized on the same day of surgery representing 87.5% of study cohort. Mean length of hospital stay was 1.96 days. In the long term (mean follow-up period was 15.2±4.6 (range: 6-50 months), 33 patients declared being relieved in relation to the pain they experienced before the procedure (VAS score of 1.5 ± 0.5). Two patients had residual pain originating from the treated vertebra with a VAS score of 4. None of the patients declared a loss of autonomy or a decrease in his activity. Vertebroplasty and kyphoplasty are two minimally invasive techniques that offer a recognizable increase in quality of life in patients with vertebral compression fractures (VCFs) by improving stability and relieving pain. In our study, a total of 68 VCFs were studied. About 20 patients (41.7%) were operated following post-traumatic VCFs, 12 patients (25%) were operated because of an osteoporotic fracture following a mild trauma or spontaneous fracture, 10 subjects (20.8%) for osteopenic fractures, 3 patients (6.25%) because of vertebral body metastasis and finally 3 patients (6.25%) were operated on because of VCFs secondary to Kahler’s disease. All patients had been diagnosed by CT scan or X-ray, then for intervention planning, MRI was done. In our series, all patients were operated on under sedation and local anesthesia. Local anesthesia can be the best option, especially for elderly patients . Preoperative and postoperative VAS scores were compared by performing the Wilcoxon test. Results were statistically better in postoperative VAS group (p < 0.001) in the whole study cohort. The mean preoperative VAS score was 7.8 ± 0.6 for the total population (mean preoperative VAS was 8.0 ± 0.8 for kyphoplasty and 7.6 ± 0.6). The mean postoperative VAS was 1.8 ± 0.8 for the total study population (mean postoperative VAS was 1.7 ± 0.6 in the kyphoplasty group and 1.9 ± 0.7 in the vertebroplasty group. There was a statistically significant difference between pre- and postoperative data (p < 0.001). However, there was no difference between postoperative VAS scores between the two procedures. In many studies, vertebroplasty and kyphoplasty are both effective in pain management, and there were not any significant differences [6, 14, 16]. Taylor et al. (2007) reported that balloon kyphoplasty is at least as effective as vertebroplasty . This was confirmed by other authors who concluded that both vertebroplasty and kyphoplasty provided statistically significant improvement in the score of the Visual Analogue Scale . Moreover, kyphoplasty significantly improved the degree of pain, restored the ventral vertebral height, and maintained the kyphotic angle . In our study, an average of 6.1° of improvement in the kyphotic angle was seen after the procedure in the total population. The mean kyphosis angle correction was 8.3° in the kyphoplasty group and 4° (±1.63) in the vertebroplasty group (p < 0.001). The risks associated with both procedures are minimal but serious complications can occur. These risks include spinal cord compression, nerve root compression, venous embolism, and pulmonary embolism including cardiovascular collapse [2, 12]. Multiple studies showed that kyphoplasty has increased the risk of adjacent level fractures and cardiac mortalities but was associated with low complication rates and risk of leakage [6, 7, 13]. 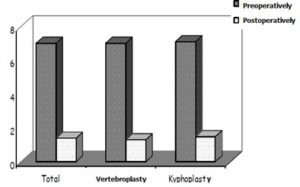 On the other hand, vertebroplasty was found to have a statistically significantly increased rate of procedure-related complications than kyphoplasty [9, 13]. In our study, one patient had a neurologic deterioration and evolved favorably after surgery. None of the patients had adjacent level compression fractures during follow-up. No tumoural evolution was seen in the patients with Kahler’s disease or vertebral body metastasis. As a result, our study supports the current literature by showing that kyphoplasty and vertebroplasty are similar interventions with identical results in terms of function and pain relief. However, our study is limited by its sample size and retrospective nature. We report statistically significant improvements in pain and mobility but we had no control group for comparison. Figure 1: Preoperative and postoperative mean values of visual analog scores (VAS) for pain, for all patients in the study cohort. 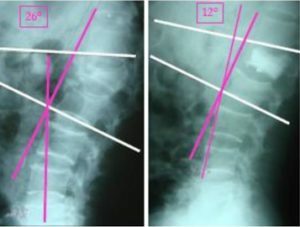 Figure 2: Kyphosis angle pre- and postoperatively for patient N°22. Figure 3: Preoperative and postoperative mean values of kyphotic angles for all patients in study cohort. BELKOFF SM, MATHIS JM, FENTON DC, SCRIBNER RM, REILEY ME, TALMADGE K. An ex-vivo biomechanical evaluation of an inflatable bone tamp used in the treatment of compression fracture. Spine 2001;26-2:151–6. CAGLI S, ISIK HS, ZILELI M. Vertebroplasty and kyphoplasty under local anesthesia: Review of 91 patients. Turk Neurosurg. 2010;20:464–9. ECK JC, NACHTIGALL D, HUMPHREYS SC, HODGES SD. Comparison of vertebroplasty and balloon kyphoplasty for treatment of vertebral compression fractures: A meta-analysis of the literature.Spine J.2008;8:488–97. GALIBERT P, DERAMOND H, ROSAT P, LE GARS D. Preliminary note on the treatmentof vertebral angioma by percutaneous acrylic vertebroplasty. Neurochirurgie1987;33-2:166–8. GOZ V, ERRICO TJ, WEINREB JH, KOEHLER SM, HECHT AC, LAFAGE V, et al. Vertebroplasty and kyphoplasty: National outcomes and trends in utilization from 2005 through 2010. Spine J. 2015;15:959–65. GROHS JG, MATZNER M, TRIEB K, KREPLER P. Minimal invasive stabilization of osteoporotic vertebral fractures: A prospective nonrandomized comparison of vertebroplasty and balloon kyphoplasty.J Spinal Disord Tech. 2005;18:238–42. HARGUNANI R, LE CORROLLER T, KHASHOGGI K, MURPHY KJ, MUNK PL. Percutaneous vertebral augmentation: the status of vertebroplasty and current controversies. Semin Musculoskelet Radiol. 2011;15:117-24. LEE MJ, DUMONSKI M, CAHILL P, STANLEY T, PARK D, SINGH K. Percutaneous treatment of vertebral compression fractures: A meta-analysis of complications. Spine (Phila Pa 1976) 2009;34:1228–32. LIEBERMAN IH, DUDENEY S, REINHARDT MK, BELL G. Initial outcome and efficacy of “kyphoplasty” in the treatment of painful osteoporotic vertebral compression fractures. Spine 2001;26(14):1631–8. MAESTRETTI G, CREMER C, OTTEN P, JAKOB RP. Prospective study of standalone bal-loon Kyphoplasty with calcium phosphate cement augmentation in traumaticfractures. Eur Spine J 2007;16-5:601–10. MCGIRT MJ, PARKER SL, WOLINSKY JP, WITHAM TF, BYDON A, GOKASLAN ZL. Vertebroplasty and kyphoplasty for the treatment of vertebral compression fractures: An evidenced-based review of the literature.Spine J. 2009;9:501–8. RÖLLINGHOFF M, SIEWE J, ZARGHOONI K, SOBOTTKE R, ALPARSLAN Y, EYSEL P, et al. Effectiveness, security and height restoration on fresh compression fractures – A comparative prospective study of vertebroplasty and kyphoplasty.Minim Invasive Neurosurg. 2009;52:233–7. SANTIAGO FR, ABELA AP, ALVAREZ LG, OSUNA RM, GARCÍA MDEL M. Pain and functional outcome after vertebroplasty and kyphoplasty. A comparative study. Eur J Radiol. 2010;75:e108–13. TAYLOR RS, FRITZELL P, TAYLOR RJ. Balloon kyphoplasty in the management of vertebral compression fractures: An updated systematic review and meta-analysis.Eur Spine J. 2007;16:1085–100. YAN D, DUAN L, LI J, SOO C, ZHU H, ZHANG Z. Comparative study of percutaneous vertebroplasty and kyphoplasty in the treatment of osteoporotic vertebral compression fractures. Arch Orthop Trauma Surg.2011;131:645–50.